Maximum Powering For Batteries & Banks of Batteries. 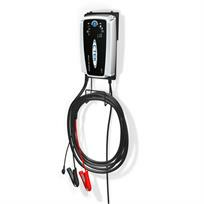 The MXS25 Extended features the same specification as the MXS25, but with extended leads, allowing the charger to be mounted remotely and the leads run to the vehicle. Ideal for use in garages and workshops, or other professional applications. The CTEK MXS25 is a sophisticated 12V automatic charger and conditioner designed for maintaining large capacity batteries or banks of batteries. The MXS25 is highly recommended for use in motor-homes, boats and caravans. The MXS25 is a rapid charger and will charge a similar sized battery in less than a third of the time compared to the MXS 7.0.